Alcohol has a peculiar relationship to happiness. We drink to celebrate, but because alcohol works as a depressant, it ends up deadening feelings. Not surprisingly, there's an observable correlation between alcoholism and depression, and even though it's not always clear which leads to which, everyone knows you can't drink like a Sterling Cooper employee for too long before becoming a perpetual sad sack. But if alcohol can lead to depression, does that mean abstaining from alcohol will make you happier? A new study suggests that the opposite actually tends to be true. In fact, those who never drink are at significantly higher risk for not only depression but also anxiety disorders, compared with those who consume alcohol regularly. The study, which was published recently in the journal Addiction, looked at more than 38,000 people in Norway. Researchers, led by Jens Christoffer Skogen of the University of Bergen in Norway, asked the participants how much they had drunk in the previous two weeks; the research team also asked them various questions to measure their levels of anxiety and depression. 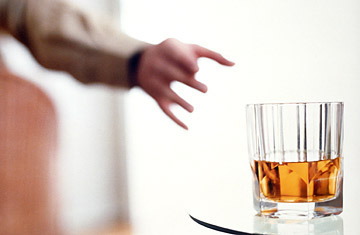 People in the top fifth percentile of drinkers had the highest odds for anxiety. But it was abstainers who were at the highest risk for depression  higher even than the heaviest of drinkers. Why? One reason is that the abstainers in the study sample were more likely to have illnesses such as osteoarthritis and fibromyalgia, and people with chronic illnesses are more prone to melancholy. Also, "some people assume it's healthier not to drink," says Skogen  which may be particularly true of those who have chronic illnesses. Finally, some abstainers were formerly heavy drinkers  alcoholics who had to give up the bottle. It makes sense that they would have more psychological distress than others, but only 14% of the abstainers in the Norway study fit this category. The most powerful explanation seems to be that abstainers have fewer close friends than drinkers, even though they tend to participate more often in organized social activities. Abstainers seem to have a harder time making strong friendship bonds, perhaps because they don't have alcohol to lubricate their social interactions. After all, it's easier to reveal your worst fears and greatest hopes to a potential friend after a Negroni or two. So does this mean we should all have a cocktail? Maybe, but Skogen says he doesn't believe his study should encourage abstainers to become drinkers. Rather, he says doctors might want to investigate why abstaining patients don't drink and explain that in societies where alcohol use is common, not drinking may lead them to feel left out. Sometimes, you should just say yes. See TIME's graphic "Addiction and the Brain."